Our petitgrain oil is extracted from Citrus aurantium var. amara (also known as Citrus bigardia and petitgrain bigarade) of the Rutaceae family. This crisp and clear essential oil is most useful to boost the conscious intellectual side of your mind, while calming anger and panic. Its relaxing properties help to calm rapid heartbeat and insomnia while clearing greasy skin and fighting skin blemishes. Petitgrain oil has a woody and at the same time a florally smell. The color of the oil is pale yellow to amber and it is watery in viscosity. This is one of the three oils obtained from the orange tree, the others are neroli from the flowers and orange from the rind of the fruit. Petitgrain oil is extracted from the fresh leaves, small twigs by steam distillation and yields 0.5 - 1 %. The chemical components of petitgrain oil are geraniol, linalool, nerol, y-terpineol, geranyl acetate, linalyl acetate, myrcene, neryl acetate and trans-ocimene. The therapeutic properties of petitgrain are antiseptic, anti-spasmodic, anti-depressant, deodorant, sedative and nervine. Petitgrain oil can help with nervous exhaustion and stress-related conditions and in particular anger and panic. It calms and soothes the mind, while relaxing the body, easing breathing, reducing rapid heart beat, relaxing muscle spasms and stomach pains. It is great oil to use for convalescing after an illness and also for insomnia and helps to clear up a greasy skin, acne and excessive perspiration, while toning the skin. 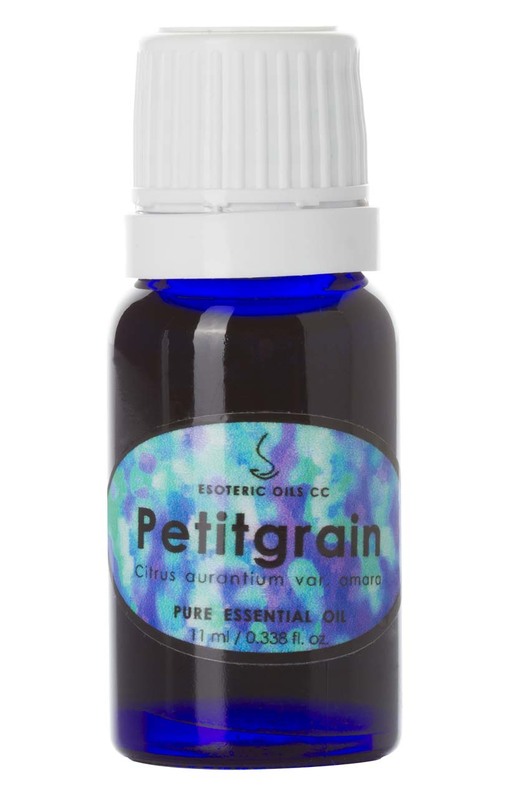 Petitgrain oil helps with nervous problems, soothes aches and pains, and helps clear and tone the skin. In vapor therapy, petitgrain oil can help with convalescence, anger, panic, depression and anxiety, calming irritation, while relaxing the body and boosting the conscious intellectual side of the mind. As a blended massage oil or diluted in the bath, it assist with convalescence, anxiety, irritability, anger, panic, tension, rapid heartbeat, pain and insomnia, while calming and relaxing the body and fighting skin blemishes. When used in a cream or lotion, it is very useful to help clear up greasy skin and to release the congestion of such a skin, while at the same time helping to clear up acne, pimples and other skin blemishes. Although most essential oils blend well with one another, petitgrain oil blends particularly well with bergamot, lavender, palmarosa, geranium, rosewood and sandalwood.